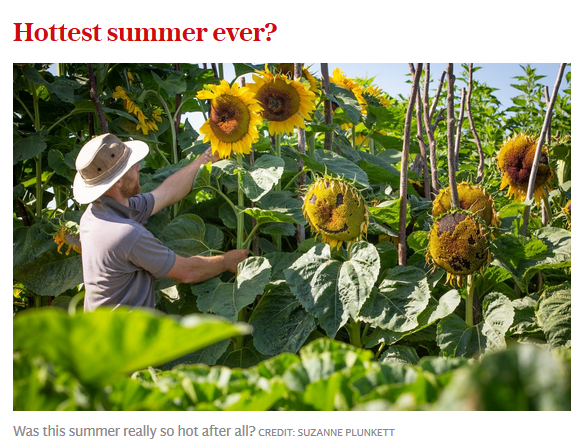 Even before August was over, the global-warming obsessed Met Office was rushing to claim that 2018 might have been the hottest UK summer on record. Last week, it qualified this to confirm that, although this summer only tied with 1976, 2003 and 2006, in England alone it was definitely the hottest ever, its mean temperature of 17.16 beating 1976’s previous record of 17.01. As often before, however, the expert climate blogger Paul Homewood looked carefully at how the Met Office sought to justify these claims. It depended on that supposed record temperature average for England, because its UK-wide database, going back to 1910, showed none of the UK’s other nations registering a new record. But herein emerged a puzzle. According to another data set, the Met Office’s Central England Temperature record (CET), meticulously kept since 1659, the summer of 2018 was not the hottest in history. It was only the fifth warmest, coming in even behind 1826. The CET’s 2018 figure of 17.27 is exactly half a degree cooler than 1976’s figure of 17.77, which the CET clearly shows still holding the English record. So why, in preference to a data set widely respected as the world’s longest continuous temperature record, did the Met Office rely on one very much shorter, which may draw on many more weather stations but which has long come under fire for the questionable siting of several of its thermometers, and where readings can be seriously distorted by local factors such as the “urban heat island” effect? Based on his diligent analysis of the Met Office’s own figures, Homewood suggests that its UK data set is no longer credible. It should, he says, “immediately withdraw all claims about ‘hottest summers’ and explain why the two data sets diverge so wildly”. It’s just so quiet, so quiet in fact that, I can hear that pin dropping. Paul, the Link does not go to that article, it goes to a Brexit one. It is really good to see him putting your analysis out there. Its further down the same article. I don’t get a second article because I don’t do “The Telegraph”. Paul, my apologies for going off-topic but I cannot see any other way to contact you on this web-site. In view of this article and other past posts on a truly great summer together with the winter that hit many of us late this year, I have been pondering (for some time, actually) encouraging people to make temperature measurements of their own. I tried buying an external (non-electric) Max/Min thermometer a while back but a reasonably priced one (alcohol) proved to be all but useless. I could do with something better. The thought occurs that there is tremendous expertise on this site. Can you or others signed-up here recommend either ‘analogue’ or digital thermometers and other useful kit, even up to fully screened weather stations, their suppliers, and also add advice on where to locate and how to use them to best advantage. May I suggest gathering this information in a separate section under the Oppenheimer quote, maybe next to the Tip Jar. And if you or others could source items and make recommendations, it might also prove a way to earn some extra site income while increasing the collection of information about our weather and our understanding of Warming and Cooling, not just in the UK but wherever your followers reside. I hope it meets with your favour but doesn’t give you too much extra work. Every time I see something about England in the summer, people are running around in sweaters. I must admit that June 15, 2015 was pleasantly warm when we were at the 800th Anniversary of Magna Carta at Runymede. Also, on the 16th when I took and underground to Kew Gardens for the afternoon. Just saw a photo of ca. 9-foot sunflowers grown by Lt. Col. Marines Retired Kent Leonhardt on his farm here in Monongalia County. He is also the West Virginia Commissioner of Agriculture. Kent and his wife also had sheep and goats until he became Ag. Com., but had to downsize due to his new job. A fascinating comparison, as always. However, the drive of all of the models is the RFF and the RCP 8.5 W/m2 model is beyond science fiction. All estimates of that un-measurable, purely mathematical convenience function, the RFF, are based on incorrect theory of the behaviour of CO2 in the presence of water vapour: the IPCC conveniently do not mention this other than in small print in their technical reports. The effect has been well known for decades, Hottel produced graphs of the effect over 60 years ago, and it amounts to a large reduction in the absorption effect of CO2 when water vapour is present. Sven Arhenius had no way of knowing of this in the 19th Century, so cannot be blamed; the authors responsible for the IPCC reports can be blamed for their incompetence / dishonesty. Now whereas technically that may have turned out correct, a failure to predict the hottest summer evah, and in essence explicitly rule it out, goodness me what a monumental failure. Booker’s article appears to add very little to Paul’s original blog of 5th September. In this blog, Paul contrasted what the CET says about various summer temperatures with what the Met Office’s Midlands series tells us. A quick glance at the map on Paul’s blog shows us that a substantial part of the Met Office’s Midlands lies outside its CET triangle. This is the more Northerly section. This raises the question of how often one might expect the differences between years A and B to disagree by more than a certain amount between the two series assuming that both were reasonably accurate. A rough and ready way of answering this is to examine such differences between a Northerly and a Southerly station whose records are believed to be reliable. I have chosen the two stations Rothamstead and Stonyhurst which represent two vertices of the CET triangle for this purpose. I have then determined how often the disagreement is greater than various amounts in all cases where years A and B are 10 years apart. I find that for 59.8% of the time the difference is greater than 0.25 degrees. For 28.1% of the time it is greater than 0.5 degrees, for 12.2% of the time it is greater than o.75 degrees and for 1.2% of the time it is greater than 1 degree Celsius. Given this, the discrepancies between the Midland and the CET series is not all that remarkable. Whether this is the whole explanation I don’t know but I would be surprised if it were not a substantial part of it. As the BBC used to say when recruiting weather watchers: “Our climate is much more local than you think”. This is the fundamental problem affecting the reliability of all series with very few stations. That is interesting, Tom. I have also been thinking about a way to see whether there is a difference between CET and the met’s midland data. I ran a quick comparison of the two sets for annual averages, just using every ten years since 1910. The Midland series is always higher than the CET. It varies from 0.2 to 9.4, but mostly around half a degree. This would suggest that what the met office have published is within what one might expect. On the other hand, most of the earlier differences are in the region of 0.7, most of the later measurements 0.4. It needs a more thorough analysis, but it would appear that different criteria are used to adjust the two sets of data. Further extrapolation of the situation would appear to show that the 0.7 difference shown by Paul does exceed what one would expect. Anyone like to follow up on this, I have little time at present? I think the main point is that you can only reliably make year on year comparisons using fixed reliable stations/data. The way the MO derives the average temperature countrywide is fraught with underlying variations and inconsistencies (especially UHI). The CET is hopefully as scientific, albeit still inadequate, as you can get, and maybe has some merit when discussing climate trends. The general pool of weather data only has value as a curiosity, pub talk. From 1910 to 2018 the difference between Midlands and CET monthly, seasonal and annual Maximum, Minimum and Mean data shows that the CET is warmer. However this difference is not consistent and there is a significant (1% level) trend in all the Minimum data and all but the October Mean data showing that the difference between the Midlands and CET has decreased over the past century. This could well be the result of the UHI and may help explain why the regional data set an apparent record, given that increases in the minimum values in 2018 over 1976, were most important. Interesting results from your analysis, confirms my suspicion form the back-of -the-envelope exercise I did. What I have also realised is that the UHI cannot be consistent. Different weather conditions will bring variations, a winter scenario with strong winds may reduce the UHI to close to zero, whilst hot sunny weather with little wind will increase it. My assumption from what Paul has posted is that the adjustment made to data for the influence of UHI is a constant. And to what stations? Each station will have be influenced differently. It must also be mentioned again that both sets of data are adjusted, but no way to find out whether they are the same for both sets of data. As you say, it does look like the gap has narrowed over time, and the likely conclusion is that it is due to the UHI. That would tend to back up Pauls version of the reason for the different 2018 values, but do consider that with the hot and windless days the HI may have been much higher this year than in others. So seasonal would be somewhere in the middle, and certainly well below the 0.7C divergence.